From left to right, Carol Baker (Vice-Chair California Water Commission), Brianna Shoemaker (Staff California Water Commission) and Armando Quintero (Chair California Water Commission) assist Frank Gehrke (Chief of the California Cooperative Snow Surveys Program) with the third snow survey of the 2017 snow season at Phillips Station in the Sierra Nevada Mountains. Chief of the state's snowpack survey program calls latest results "a pretty phenomenal snowpack." Striking drone video shows extent of damage to the main spillway and work to remove a large debris pile from the Feather River. Watch the video, read Metropolitan's Lake Oroville fact sheet and view recent photos taken by the Sacramento Bee. Read the fact sheet and Metropolitan's newsletter. This winter's rains have set the stage for a spectacular display on the wildflower trail at Metropolitan's Diamond Valley Lake. After five years of drought, the green hillsides around Southern California’s largest reservoir in Riverside County are starting to show brilliant hues of orange, violet and blue. Join Metropolitan for its 10th year of hosting the Spring Green Expo, a showcase for innovative sustainability solutions. The expo includes "green" exhibits, an ECO Innovators' Showcase, seminars and a photo exhibit. Learn more. 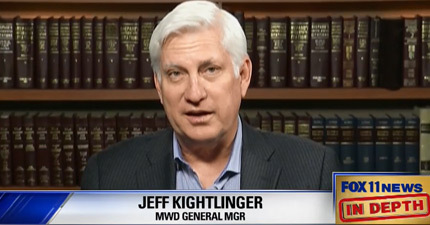 General Manager Jeffrey Kightlinger talks about Lake Oroville, state infrastructure needs, water bonds, operations and maintenance funding and more on KCRW radio’s Warren Olney show and on KTTV Fox News’ In Depth public affairs program.